Home / GST-Tally / TallyERP.9 Lessons / How to Record Purchase Return under GST in TallyERP9? 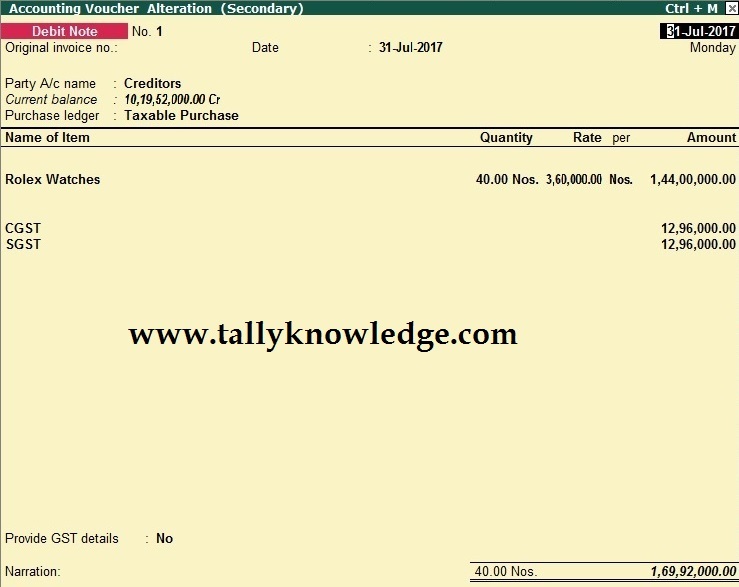 How to Record Purchase Return under GST in TallyERP9? When you purchase any item and due to damage or any other reason, you have to return the item to seller, then this transaction comes in Purchase Return. You can record a purchase return in Debit Note. Your Debit note will be appear in GSTR - 2. Under GST you have to ensure that you are using unique numbering of your purchases and the same can be reverse in purchase return. There is two type of purchase return under GST (Inter State and Intra State). Inter State purchase is from outside the state and intrastate purchase is purchase in the state. Mention original invoice no., date of invoice. In Provide GST Details mention Change in POS. Similarly you can enter interstate purchase return. 1. Sales Return - When there is a return of goods or services after sales. 2. Post Sale Discount - When discount allowed on goods or services after sales. 3. Deficiency in Service - when there is a deficiency in services (like a quality issue) after sales. 4. Correction in invoice - When there is a change in the invoice raised that leads to change in tax amount. 5. Change in POS - When there is a change in Place of Supply that leads to change in tax amount. 6. Finalization of Provisional assessment- when there is a change in price or rate after the department issues a notification about the finalized price of the goods or services. BHAI MERE Y KAUN BATAYEGA KE INPUT GST LENA HAI YA OUTPUT GST YAR.? Thanks for the comment .You can connect us on 8920287934 only Whatsapp no call.